When we are coming into a new port in the early morning, I almost always seem to wake up at the right time to watch our approach. My body must sense the difference in the ship's motion or speed as it slows down to pick up the harbor pilot. This was one of those mornings and I am very grateful for it. 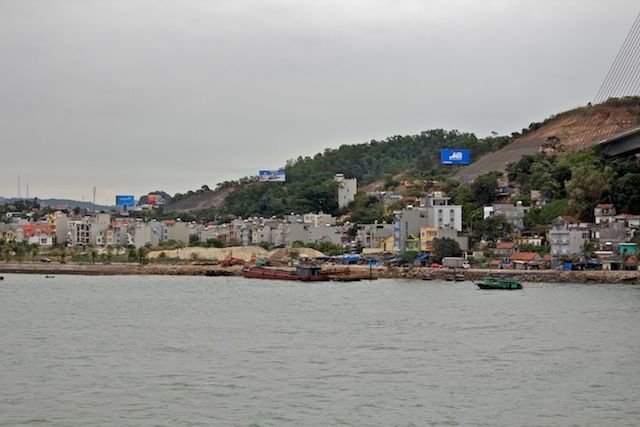 We began a long ride into Ha Long Bay about 7am. At first, when I looked out I saw nothing but sea. Then I went out on the balcony and looked to the side of the ship to see a huge stone monolith. This was the first of many. 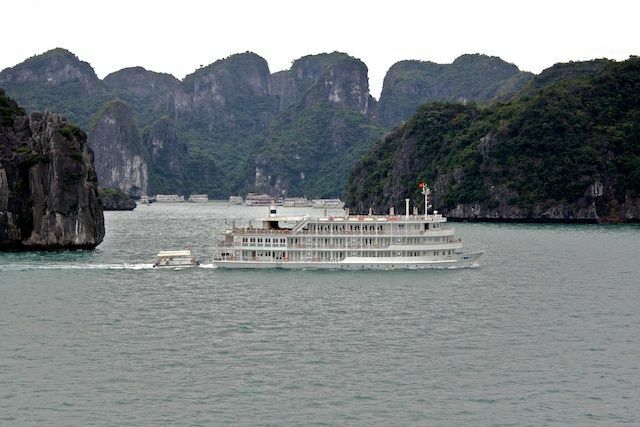 The info we received in our daily ship news says there are 1,969 islands of various sizes in Ha Long Bay. As the ship progressed slowly in we saw more and more of these. 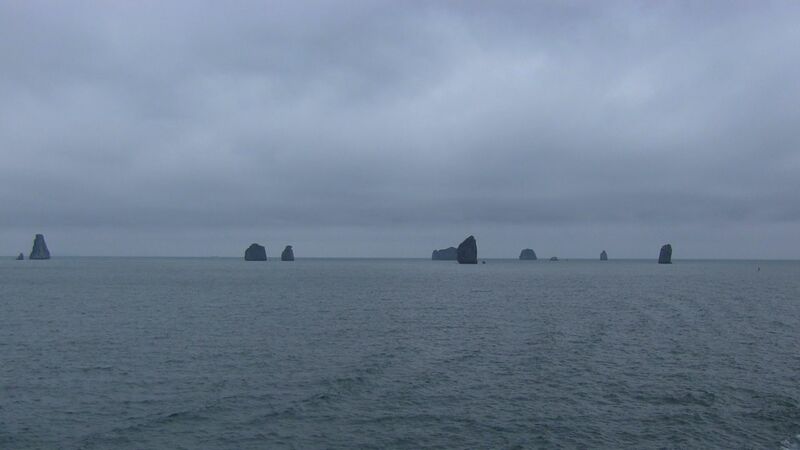 Some are the size of true islands, like the ones in the photo at the right, while others are narrow rocks jutting out of the water like those shown above. 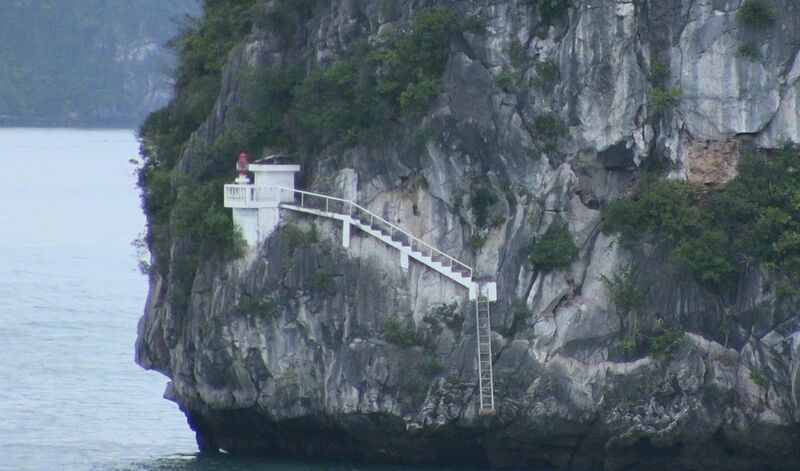 The ship had to follow a narrow path to avoid the rocks. It took around 2 hours to get through them all. 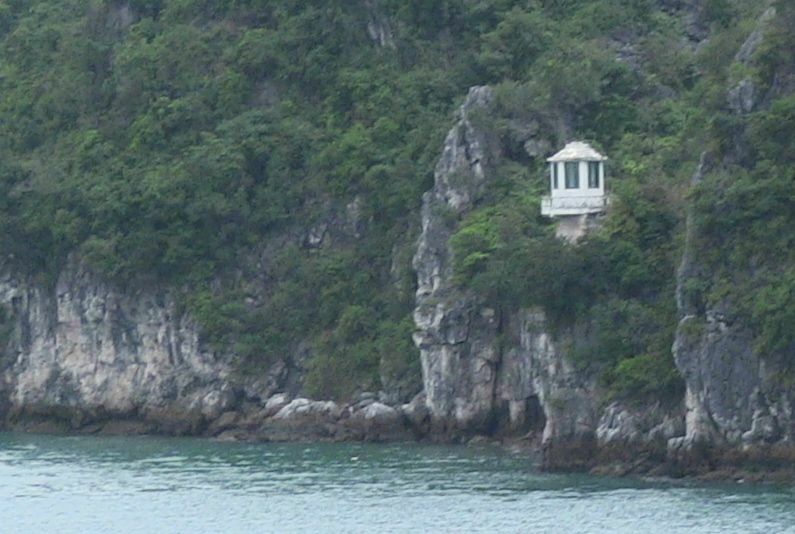 Along the way, I saw several small structures built low on the rocks. It was hard to judge their size. I lost all perspective against these massive rocks. I originally thought these might be spirit houses, like the Buddhist spirit houses we saw in Indonesia. As I mentioned in a post from last week, these are small buildings, the size of our bird houses, used to leave offerings to the spirits to appease them so they won't bring evil to the house. I suspected these might be to ward off evil weather in the bay. However, when I saw the one with the ladder and stairs, I began to question my perception of size. 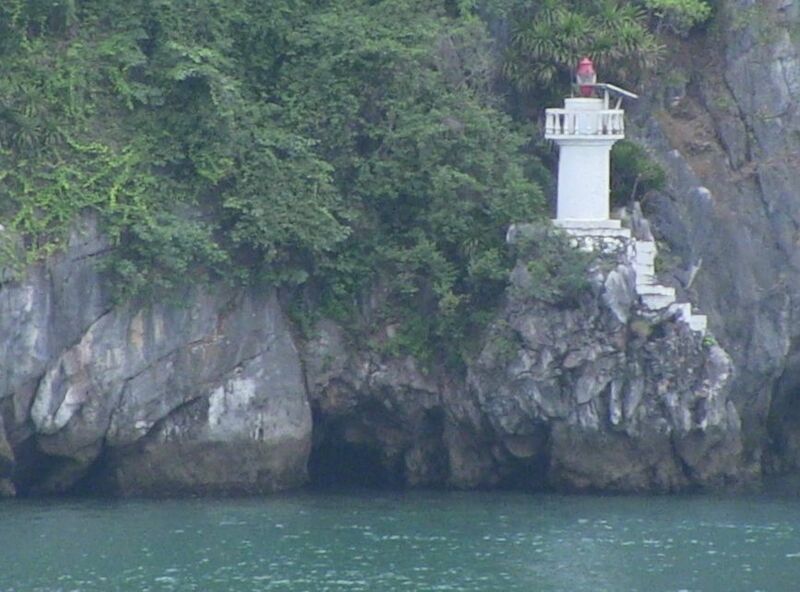 These may be lighthouses marking the rocks. Regardless, I found them very interesting. There were tours scheduled to take people out on junks to explore these islands, but I think we got a good enough view this morning without going on a separate boat ride. We were originally booked on a tour called "Halong's Countryside," but after reading the description again we decided to cancel. The tour most people booked was "Full Day to Hanoi," but neither of us wanted to do this. Ray didn't want to go to Hanoi and I did not like the idea of an 11 hour tour, with a 3 hour drive each way. I'm very glad we didn't go. The ship docked a little late and the tour didn't leave until after 10am. That means they probably won't get back until about 9pm, traffic permitting. Lunch was included in the tour, but I don't believe dinner was. They will be very tired and hungry when they get back. Although we didn't leave the ship today, it looks like a lot of the buildings on shore are new cement construction. We are seeing a lot of that everywhere we go in Vietnam. The old thatched huts are being replaced with more substantial, if simple houses. This is a good thing. Tonight the kitchen/dining staff prepared a barbeque on the pool deck. They had a buffet set up around the pool and tables where the lounge chairs usually are. It was very nice. We are staying overnight in port and tomorrow we have a short tour in the afternoon, so we get to sleep late tomorrow. It was nice to rest up today after two long touring days, but it will still be very nice not to have to wake up for anything tomorrow.